If you happened to read our 2018 year in review, Michaela D’Onofrio’s name probably looks familiar. 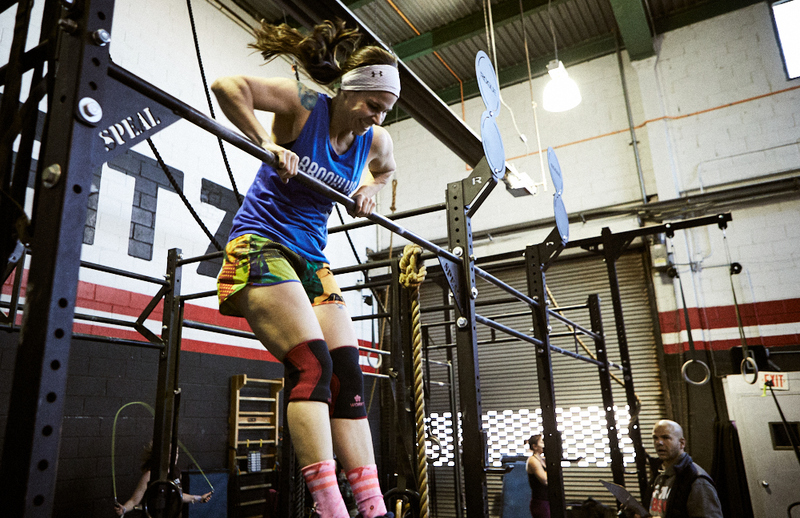 She topped the leaderboard for the most PRs: an impressive 114! And, of all of CrossFit 718’s female athletes, she had the highest rate of attendance: 242 classes. We’re pretty sure those two numbers have something to do with each other. For the past five years, Michaela has continually inspired us with her dedication and performance. We can’t wait to see how she does in this year’s Open! Read our Q&A with Michaela and learn more about February’s Athlete of the Month. A little over five years ago, I had just moved to the area and was looking to meet people and compete in an activity. I always played some sort of sport or rec league activity growing up and, since I was not involved in anything and new to the area, I thought it may be a good time to check things out. I didn’t know much about CrossFit (I’d heard it was like a cult), but I had been lifting weights and was bored with the same routine. Trying CrossFit seemed like an obvious choice, as it just looked fun. Luckily, when I googled CrossFit gyms, 718 was only a few blocks away. I was hooked after my first trial class with Tammy. I did basics the following week and haven’t looked back. I immediately knew that it was what I had been looking for. After a few classes, I realized I was starting to push myself farther than I ever have. Each class I wanted to achieve a better performance than the previous class. I have always been somewhat fit, but not like this. I wanted to keep getting stronger and stronger, and CrossFit has taken my training to another level. I am in better shape now than when I was in my 20s. Striving for small goals has been key for me. I celebrate even the smallest PRs or when something finally clicks. You’ve participated in the Independent Design program. What has that experience been like? The ID program has worked out really well for me. I look forward to doing it each year, and it is something I would like to continue doing. It’s been a learning experience, and we have tweaked it along the way. What is great about doing ID is that it’s designed for me and my specific goal: to gain weight through a hypertrophy/ strength program. Besides, how can you beat eating a lot and bodybuilding?! Making time to work out has never been an issue. I grew up in a family that valued fitness and a healthy lifestyle, so it was ingrained in me at an early age. As my partner says, it’s like a second job to me because I’m so committed. My favorite movements are anything to do with body weight, so gymnastics stuff. I’ve gotten pretty proficient and use this to my advantage during metcons. My most recent PR is Fran: 3:48 RX. For whatever reason, this is the one workout that always makes me so nervous and gets in my head. I’m really proud of this, as I got this time after gaining 10 pounds on my mass/ ID program, and at that point, I hadn’t really done a lot of metcons / conditioning pieces. What I enjoy about CrossFit is being able to redo a metcon to compare times/scores. It can take months or a year to shave off a few seconds from a score, so it’s a great feeling when it happens. It’s just proof that it works. I’m currently working on getting more proficient in squat cleans. For whatever reason, my body just doesn’t like to drop under the bar. During the winter, I try to snowboard as much as I can, and in the summertime, you’ll find me playing corn hole at the beach, riding bikes, or doing anything outside.